The Niagara Independent, November 9, 2018 – Recent government announcements and news reports have provided Canadians with an accounting of how much our Canadian governments are in debt. The current federal government, spending hundreds of billions of dollars, seemingly pays no heed to the size of their annual deficits. Add the sum of all provincial governments’ deficit budgets and one soon realizes that our governments are burying us in a deep, dank financial hole; from which no Canadian alive today will likely climb out. The reported numbers are startling. In Ottawa, the federal government recorded a shortfall of $19 billion for the last fiscal year, repeating the deficit amount of the previous year. The government reports its federal spending continues to rise and is now $332 billion – $332,000,000,000 – the highest amount of government spending ever recorded. 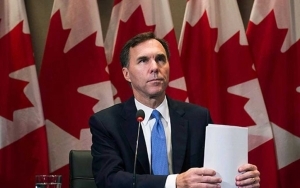 Finance Minister Bill Morneau and finance officials will be quick to point out that the $332 billion figure is higher than in the past because of a change in accounting practices. But, this explanation does not address the fact that the federal government spending continues to increase. The trend of overspending in Ottawa has resulted in the government adding almost $20 billion to the national debt in the 2017-18 fiscal year. As of March 31, 2018, Canada’s net debt is $758 billion. PM Justin Trudeau recently indicated his government will not balance the books before the election. Neither he, nor the finance minister, will offer a target date for when the Liberals can commit to a balanced budget. In late October, an independent report on the state of federal finances assessed that the government will require deeper-than-expected deficits in each of the next few years. Canada’s federal parliamentary budget officer concludes that there is only a 10 per cent chance the federal books will return to balance in 2021-22, and a 30 per cent chance of seeing black ink in 2023-24. Are Canadians left to assume annual deficit budgets are here to stay? Factoring in all of the latest news on our government’s finances, the combined federal and provincial debt currently stands at an astounding $1.4 trillion – a figure that has increased by more than 60 per cent in the past decade. Canadians often hear Finance Minister Morneau crow that Canada has a very low federal debt-to-GDP ratio of just over 30 per cent. But, again, when factoring in all levels of government collectively, the Canadian governments’ debt-to-GDP in the last 10 years has risen from 69 per cent to 87 per cent. Lots of figures. Lots of debt. Why should Canadians pay attention? Simply put, our current government spending and the national debt load directly impacts future governments’ abilities to respond to changing circumstances and global pressures. Our governments’ deficit budgeting curtails Canadians’ choices and opportunities – today, and for generations to come.